Bulk Discounts for Full Tilt™ Extendable Tilting TV Mount For TVs Up To 85"
You've never seen a tilting mount quite like this. 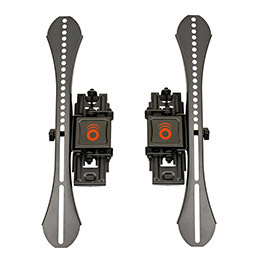 Hybrid design has the benefits of a classic tilt mount, without the negatives. Extends 5.8" from the wall for max tilt range and easy cable access. Somebody call Professor X - we've got a mutant on our hands: This beast's hybrid design extends 5.8" to give full tilt on even the largest TVs. 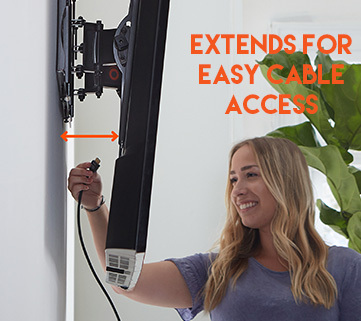 Outta' sight, outta' mind… but not outta' reach: Mount extension allows easy cord and component access, even behind today's monster screens. Mounting above the fireplace? You fancy. You also in luck: This mount's extendable design is perfect for getting full tilt over-mantle mounting. You know what they say: Big TV... big mount. This one holds tight onto 40"-85" screens weighing up to 125 lbs. Off-center studs? Sliiiide to the left. Sliiiide to the right. Extra-wide wall plate allows for effortless screen placement adjustment even after installation. Don't cope with crooked! You deserve better. 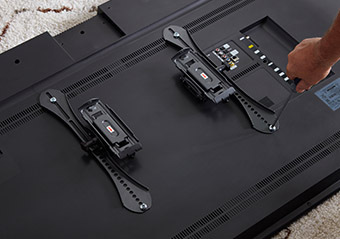 Your TV can be easily leveled after installation. LG TV? Sony? Vizio? Samsung? TCL? Swipe right. It's a match! Universal mounting system and hardware is compatible with all major TV brands. Got 30 minutes? 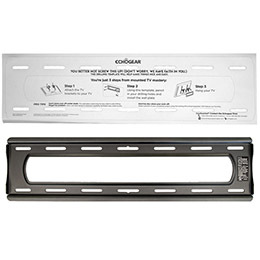 This mount installs in 3 easy steps, thanks to included pre-divided hardware and drilling template. Do you remember when you thought a Billy Mays infomercial was over, but then Billy stops the show with "But wait, there's more"? Well, this tilting TV mount might not be Oxyclean but wait, there's more! This full-tilt TV mount combines features from a standard tilt mount, with the benefits of a full-motion, all in one value-packed, advanced tilting mount. So, What's the point of the Echogear full-tilt mount? Tilting a big TV is hard because of our old arch-enemy, geometry. Classic tilt mounts are too low-profile, and your TV just bangs against the wall and ruins the paint job when you try to tilt the screen. By extending from the wall 5.8", you'll have plenty of room to tilt your TV up to 15º, even if it's a mammoth 85". 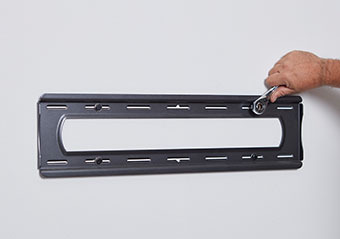 That makes this mount ideal for installing above eye-level, like over a fireplace. That way you'll ensure enough tilt to eliminate glare and get a comfortable viewing angle. Just picture Christmas morning with the fireplace roaring, eggnog in hand, and a Nick Cage marathon on TV, that's bliss. If you've ever dealt with a low-profile mount before, you know getting at component cables in the back can be a real battle. You'll probably swear a few times and come out with bloody knuckles. Now you can save your curse words for the football game. In addition to getting the max level of tilt, extending from the wall 5.8" gives you plenty of space to plug in whatever you need. Dust off that N64, we've got GoldenEye to play! 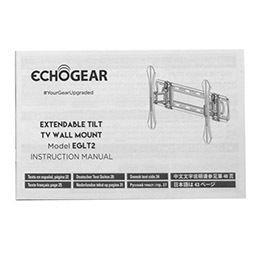 With Echogear, you know you're getting a great value, so what else does this mount have? Well first off, our tilt is tool-free. All you'll need is a functioning set of hands to place the screen exactly where you want it. As a bonus, this tilting mount also can swivel 10º left and right to help get you the perfect viewing angle. Sometimes wall studs aren't perfectly centered where you need them, but no worries, simply slide the TV left or right on the wall plate and lock it into place. Is your significant other giving you hell because the TV doesn't look level? It's happened to the best of us, but we've got your back. 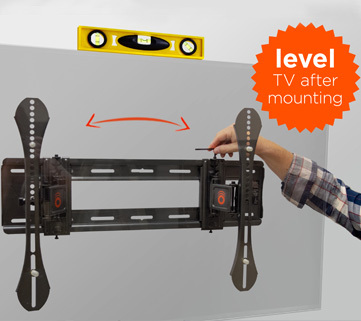 With post-install leveling, it's easy to adjust the TV without drilling more holes in the wall. Now that is a win for everyone. You'd definitely need another beer run if you had to reinstall the mount. We know that not everyone can have Chip Gaines' carpentry skills or boyish charm. Every mount we make has a simple 3 step-install and an easy to follow manual that even cracks a few jokes along the way. 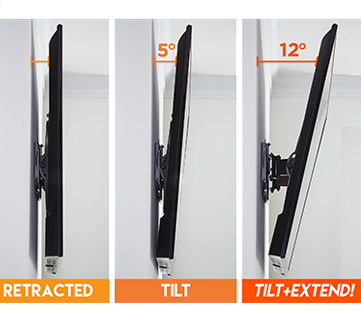 Included with the max-tilt mount is a wall template that'll help you find the perfect spot for your TV before you drill. It should only take about 30 minutes to get your TV on the wall. Not sure if this mount will work with your TV model? 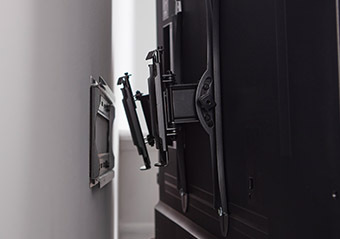 The universal design and extensive hardware pack are made to fit as many TVs as possible. We've even got expert help standing by 7 days a week if you've got questions or run into a snag. Good luck finding that with a cheap knock-off mount. What kind of wall do you have? Out of the box, the full-tilt mount will work with wood studs (16" & 24") and concrete walls. It can also be installed in steel studs, but you'll need to pick up some extra hardware for that. 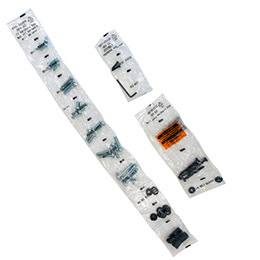 Lucky for you we sell a steel stud mounting kit. In case you've never shopped with Echogear before, just know that we stand behind everything we sell, you'll always be satisfied with Echogear. Come to think of it, there isn't really a good reason to buy from anyone else. 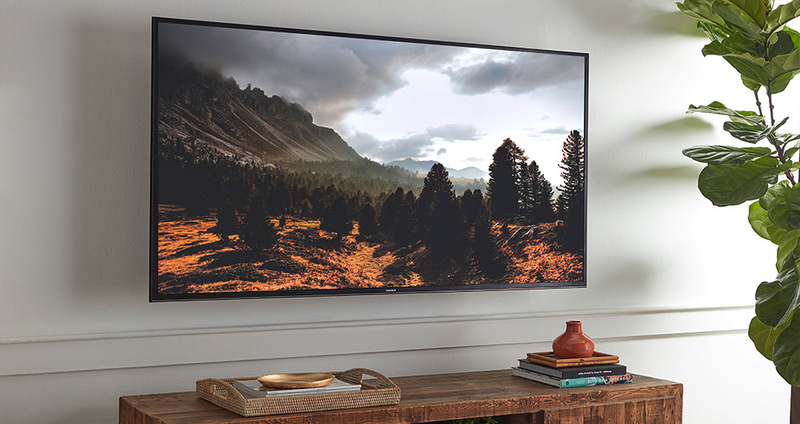 TV Size Range: 40" - 85"
Fits Wood Studs: 16" or 24"
“If you like the compactness of a tilt mount, but want to pull the TV temporarily away from the wall to manipulate cables, this is the mount for you.” -Jason N.
Click the button below to add the Full Tilt™ Extendable Tilting TV Mount For TVs Up To 85" to your wish list.